Address: 430 Little Collins St, Melbourne. Lunch - Tuesday to Friday, reservations from 12-2pm. Dinner - Tuesday to Saturday, reservations from 6.30pm - 8.30pm. What more could a girl want on her 21st birthday than French Champagne and a degustation dinner worth more than she makes in a week? Little comes to mind, other than a date with Jake Gyllenhaal. But after dining at Vue de Monde, I would choose to eat there again over any movie star, any day. It is inaccurate to call it a 'dinner.' It is nothing less than an experience. From the moment the door is opened for you as you enter the subtly lit modern space, it is obvious Vue de Monde is the finest of fine dining. The host took my coat and proceeded to wish me happy birthday – It was as if I was doing them an honour by choosing to dine with them. Glazed with excitement, the eyes take in the pristine white tablecloths and the lines on the dark wooden floors that lead to the open kitchen. It is a main feature in itself and the best seat in the house looks over the marble bench where the food is being continually plated. The chefs, who outnumber the customers, cook in synchrony and create magic. They spin and duck around each other and miraculously avoid catastrophe. Round light bulbs on red wire stems hang from the ceiling like topsy-turvy bouquets of flowers strung in bunches. Dark material drapes line the frosted windows, complementing the suave colour scheme of white linen with contrasting earth and metal tones. Modern artwork, perfect rows of deep blue glasses, and colourful striped chairs add splashes of colour. There is also a private dining room if one desires. 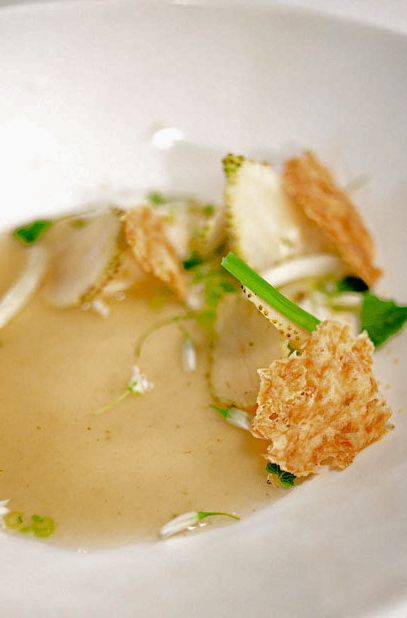 While the service is characteristically outstanding, the food is otherworldly. Each chef presented their dish, personally, to our table. Jus was poured, reductions drizzled and glass domes lifted. Not only was every plate a masterpiece, but also every cook had somehow been informed it was my birthday, and greeted me accordingly. Since we were celebrating, we drank Larmandier Bernier Cuvée Vue de Monde Blanc de Blancs Champagne, France. It was perfectly bubbly, light and refreshing – a must considering how much we ate. Cynics will say that nothing is perfect, but Vue de Monde comes pretty damn close. It is truly in a class of its own and the only way to describe the food is to list it, although it I guarantee that whatever I say will not do it justice. The very first dish was described as a 'Muesli bar.' Far from your average lunchbox treat, it was served atop volcanic rock on a cooling water pillow. The base was made up of wild rice, quinoa, pumpkin seeds and buckwheat, topped with more pumpkin seeds treated by liquid nitrogen so that they formed a 'snow.' Crunchy, cold, and somehow tasting unlike any of its ingredients, there was hardly time to consider the mix of textures in the dish before the next one arrived. Next on our gourmet adventure was Bluefin tuna served with sweet and salty caviar. It melted in the mouth and tasted like it had jumped into the kitchen and prepared itself seconds earlier. As if the ingredients were not fancy enough, it was doused in 'sake foam' and placed in Japanese spoons resting beside the fish's marrow, covered in an oyster emulsion. To follow on from the pumpkin snow, this dish was served on edible sand. Who would have thought? 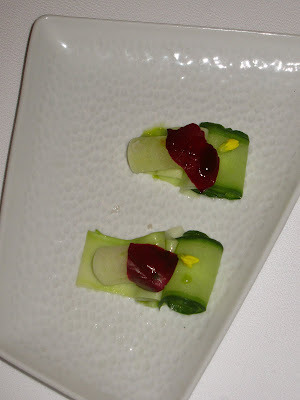 The vegetable terrine was light and fresh, made up of apple and cucumber with pickled rose petals, the latter of which complemented the sweet juices of the rest of the dish. 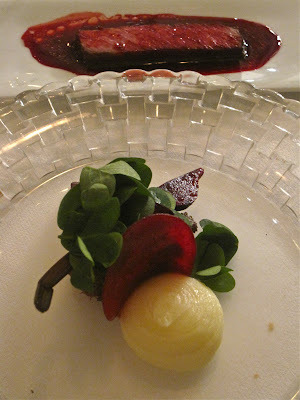 To cleanse the palate before the main dishes, we next encountered 'Jardin de Legumes - Heide vegetable garden.' It was an assortment of finely shaved radish, pumpkin, carrots and celery sprouts, all perched on a bed of olive oil powder that covered a smooth avocado puree. The olive oil powder was incredible: it was the consistency of a cloud, or more accurately, room-temperature powdered snow, which dissolved as it hit the tongue and tasted exactly like olive oil, providing the dressing. 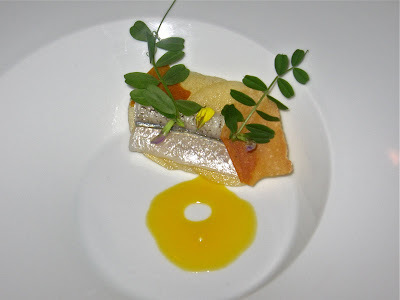 The first of the mains was pickled garfish with swedes. The chef delicately placed the dish in front of us before revealing a small pipette filled with a passionfruit reduction, with which he made an artistic shape on the plate. The tangy reduction complemented the soft fish perfectly, while the swedes added a watery, crunchy texture to an otherwise soft dish. Moving along in the animal kingdom, we were next presented with 'fried duck egg' served with onion sauce. Boring? Maybe... if it weren't actually the yolk of a duck egg served floating on a potato foam. The fluffy texture of the foam oozed between the thick yolk, making it hard not to savour every bit. Served as a luxurious side, and possibly even more delicious, were two scallops with a shaving of white truffle. A lighter morsel followed the egg dish. 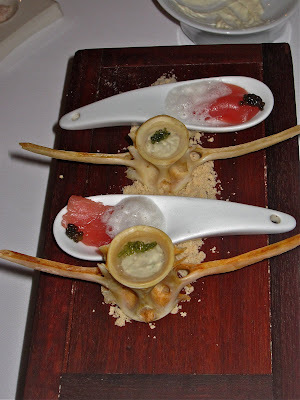 We were served a fascinating mix of house made ricotta, green strawberry, horseradish, and Osetra caviar. Although a strange combination, it was still tasty. As an added bonus it made you think really hard about each component as you ingested it. The creamy ricotta had a sting added by the horseradish and tangy green strawberry, which also made up the sauce. Elderflowers splashed some colour on the plate and a fine oatmeal crisp added some weight to the dish. 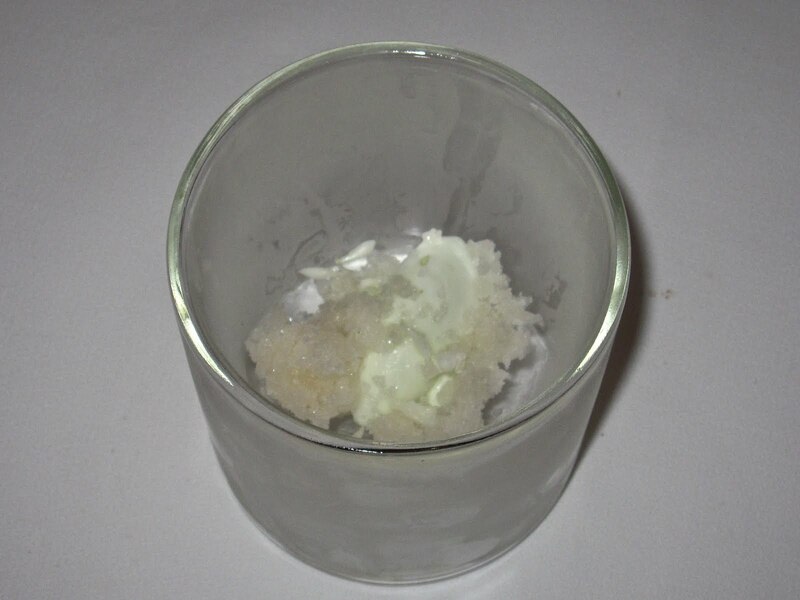 As a quick refresher, we had an icy cucumber sorbet topped with elderflower granita, which was complemented by the tang of frozen lime. The heavier dishes were next, the first of which was roasted marron, crab, duck tongue, and apple. Marron is a delicious shellfish, similar to a lobster only much more tender and juicy. The faintly fishy aroma complemented the dollop of smooth apple sauce and was by no means overpowering. The duck tongue, which thankfully didn't resemble one, was crisp and a perfect match to the sweet swimmer crab it rested on. The kangaroo, rosella, coffee and chocolate dish was a stand out for me. I become so excited hearing what has been prepared and thinking, "there is no possible way these ingredients will be palatable together," and then being proved utterly wrong. A glass dome was lifted from the plate, causing fragrant smoke to waft away and reveal the kangaroo. It was smoked with coconut and was cooked to perfection: well done on the thin outer layer and rare and succulent on the inside. Although a less popular meat, the powerful flavours of the dark chocolate and coffee crumble subdued the kangaroo appropriately, while the cauliflower puree was, interestingly, the sweetest component of the dish. The next main easily rivalled the previous one. Blackmore wagyu beef cheek cooked for 16 hours was surrounded by richly coloured beets, bright green wood sorrel and a perfect, creamy sphere of potato. Although it was very tasty, the short rib, served simultaneously, was an absolute winner. Tender and moist, it came doused in the most intense, amazing sauce imaginable of bone marrow and cranberries. The contrast of sweet and savory was overwhelming, and I think at this stage of the meal all conversation ceased and was replaced with primal eating exclamations of gluttonous bliss. How could it possibly get any better you ask? With dessert. Before the sweet stuff we had an exquisite cheese plate. The Maffra cloth matured cheddar was flavoursome and sharp, wholly enhanced by a crunchy mustard crumble and a puddle of parmesan and apple sauce. By now, I became fully focused on what I was consuming. It all started with the 'frozen lolly, popping candy, homemade lemonade' dish. Small inverted pyramids of house made, frozen vanilla bean custard were suspended above a shot of traditional lemon squash and crowned with a layer of popping candy. Toothpicks jutted out the top for easy eating. It was a modern take on a spider: you took a bite of the custard, had a sip of the lemonade, and sat back in wonderment as your mouth fizzed and exploded with the sweet candy. I'm not sure if I have ever been so happy. ...That is until the next dish of 'rhubarb and milk’ arrived. It came beautifully presented on a black, glossy palette that contrasted with the creamy colours of the dessert. The textures were so diverse it was mind boggling, and all you could do was surrender to your mouthful of rhubarb, milk and a touch of fennel. The fennel was in the form of a cream and a crisp, the milk in a sorbet, dust and meringue and the rhubarb in a sweet jam. It looked like a gastronomic milky way, and I assume it is what fairies eat on a regular basis. Being an absolute sucker for all things chocolate and caramel, my eyes popped out of my head when I saw the final dessert, 'Honey crunch soufflé.' O-M-G, as they say. It came with a dollop of rich but not overpowering chocolate mousse with honeycomb and violet petals scattered around the fluffy, perfectly turned out soufflé. To finish off our miraculous meal, there was a selection of petits-fours. First was a wooden slab that came with homemade lemon jubes. Expecting them to be sweet, I was pleasantly suprised when they turned out to be sour! A mini version of Crepes Suzette came in small pans with a thin wafer served with a Grand Mariner dipping sauce. In the centre was chocolate covered orange on toothpicks. Following that, we indulged in chocolate mousse laminations, a modern version of the classic Australian treat with a liquid raspberry coulis in the centre. They came with nutty pistachio nougat as well. Our final dish was an oozing, soft, mint flavoured marshmallow. Served on a volcanic rock like the 'muesli bar 'entree, it provide a neat end to my seemingly infinite appetite. Even though it felt like the dishes would keep coming forever, the bite-sized marshmallow finish was over much too soon. We thanked our chefs and hosts and then made a huge effort to roll out of the best restaurant I have ever eaten at. However, the experience did not end with the meal. As we made our way to the door, we received a breakfast pack for the following morning. Inside was a brioche loaf, two free-range eggs, two chocolate dipped cookies and an amazing herbal tea concotion of orange peel, kaffir lime leaves, lemongrass, lavender, thyme and star anise. The tea was exactly what I needed to aid my digestion. *** A big thank you, a bigger hug and an even bigger kiss to John Levin for making this meal possible.